Eastern Market Opening Shed 5 This Saturday After $8.5M Renovation! The Shed 5 project includes a fully-restored public market space as well as a first-of-its-kind Community Kitchen, educational and meeting space (The Kid Rock Kitchen Commons) and the new, outdoor DTE Energy Foundation Plaza. Ceremony featuring Detroit Mayor Mike Duggan and Senator Debbie Stabenow at 10 a.m. The Comerica Hatch Detroit Contest is Baaaaaack!!!!! The Comerica Hatch Detroit Contest is back! Submit your brick & mortar retail business idea starting May 1st! Those of us who know and love Detroit consider it a kind of half-finished heaven. We favor its brawny, threadbare aura, its onion-and-mustard-spangled coney dogs, its rambling thoroughfares from a time when Cadillac Eldorados ruled the roads. The city's lonely Gothic churches, historic Art Deco skyscrapers, and spacious island park are joined by a vast network of urban farms growing all sorts of delicious, fresh things in between swaths of concrete jungle. These farms, together with the city's new restaurants dispersed in pockets all over town, make an urban road trip the best way to explore Motown. Start your cruise at Anthology Coffee (1401 Vermont St.), the city's newest specialty roaster. The warm, airy café is stashed away behind an obscure yet quintessentially New Detroit spot: a co-working space for local entrepreneurs and creative types in a former Corktown printing factory. There, owner Josh Longsdorf brews his single-origin beans at a Modbar espresso machine and a spacious pour-over bar. Suitably caffeinated, you'll want to head northeast on Jefferson Avenue, through downtown and past the iconic Joe Louis fist-bump monument at Hart Plaza, keeping Canada on your right, until you arrive at Rose's Fine Food (10551 E. Jefferson Ave.). Run by cousins Lucy Carnaghi and Molly Mitchell, the 30-seat restaurant specializes in refined diner food, like brisket hash, huge cinnamon rolls, and old-fashioned egg creams. Consider taking your meal across the water on Belle Isle, an idyllic 1,000-acre island park with an Albert Kahn-designed aquarium and conservancy plunked in the middle of the Detroit River. On the 1st June 2015, Virgin Atlantic will launch direct flights to Detroit, the birthplace of Motown, Madonna and the motor car. Flying daily from London Heathrow, we will be the only British airline to fly direct to this fascinating city. Customers can also take advantage of Delta Air Lines’ services and connect onwards to other US cities including New Orleans, St Louis, Indianapolis, Salt Lake City and Nashville. Is Rose’s Fine Food a diner? Let’s look at the facts: The space, on a decidedly not-hip main drag on Detroit’s east side, has been a diner on and off for decades (cousins Lucy Carnaghi and Molly Mitchell leased it, coffee cups and all, last July). The menu, with its bacon and pancakes and fried fish sandwiches, can read like a truck stop’s. But then there are those “crybabys,” house-baked potato doughnuts glazed with maple and orange zest one day, wild raspberry the next—not to mention that plate of green-onion pancakes with herb-pickle sauce, and that bag of locally milled organic flour used to make the chunky biscuits. Few diners take the eat local ethos as seriously as Rose’s; fewer still serve a rabbit sandwich on homemade bread. That’s the charm of Rose’s. (And charm is putting it lightly; it’s more like a gravitational pull—one that instantly makes you feel like a regular.) 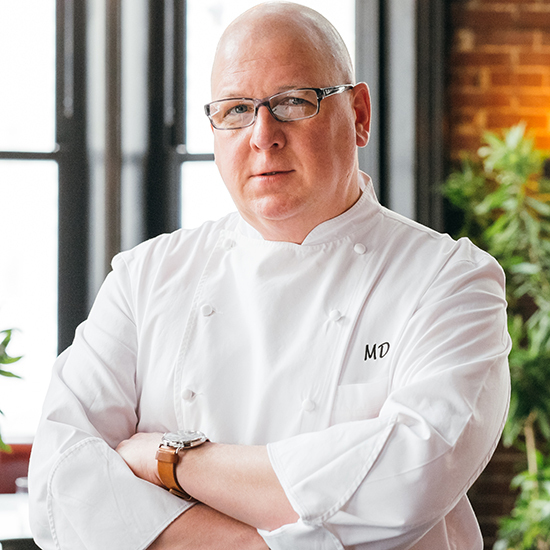 The cousins work to make their restaurant a place that is, as they say, “what real old-school diners were: for all people.” And they’ve succeeded. The DIA Is Taking To The Streets Again With Their 'Inside Out' Tour! Map It Here! The Detroit Institute of Arts (DIA) is taking art to the streets around Metro Detroit for the sixth year in a row. The DIA announced on Friday the participating cities in this year’s popular Inside|Out program, which brings high-quality reproductions of masterpieces from the DIA’s collection to outdoor venues throughout the area. Over the past five years, the DIA has installed more than 800 reproductions in over 100 communities. During the 2015 season, eight venues will be participating for the first time, including Midtown Detroit; the Osborn neighborhood in Detroit; Grosse Ile; Memphis; Ortonville; White Lake; Flat Rock; and Wolverine Lake. Highlights for next year include new images that better reflect the diversity of the museum’s collection and broad interests of communities. During the summer months, the DIA will partner with Southwest Detroit Environmental Vision to create an Inside|Out community garden exhibition. The exhibition will illuminate a handful of Detroit community gardens and provide new programming opportunities within the intersection of gardening, nutrition and art. The DIA will also partner with the Huron River Watershed Council to host an Inside|Out exhibition in the five Huron River Trail towns, an initiative to help develop an arts and culture component on the Huron riverfront. The DIA encourages each community to plan activities centered around its Inside|Out works. Previous events have included bike and walking tours, bus tours, talks at local libraries, festivals and more. More than 80 reproductions will be in 10 communities from April to July, and then in 10 other communities from August to October. Each community will have from seven to 12 images clustered within walking or bike-riding distance. National Geographic 3 Part Detroit Series: "You Can't Save Detroit. You Gotta Be Detroit"
Let me introduce you to a few Detroiters I encountered when I returned to the city where I was born and worked for 25 years. After we moved away, for several years we kept a small condo there, overlooking the Detroit River. In the same way you never forget your mother, your heart never leaves your hometown. I did not seek out Mike Duggan, the energetic new mayor and the first white one in four decades in the largely black city. Or the leaders of businesses and foundations that donated hundreds of millions to help free Detroit from bankruptcy. Or multibillionaire Dan Gilbert, Detroit’s sugar daddy, who founded Quicken Loans, the nation’s largest online mortgage lender. Gilbert moved Quicken to his hometown, bought more than 70 properties (mostly downtown and ripe for rehab), seeded dozens of start-ups, and employs an estimated 12,500 people. My curiosity was not about the mighty directors of this unfolding drama but the small players who are creating a new city out of what was long dismissed as a wasteland. Some moved in with solid plans; some nurse airy dreams; some subsist on fortitude. Others pray that their candles, so far from the changes, might somehow catch a spark. Detroit’s decay is now its engine: Nowhere else in urban America can you do so much with so little money. The new Detroit shines downtown. Nearby areas like Corktown and Midtown radiate energy. But around this incandescence skulks the old Detroit, acres of decay and ruin, prairies where the remaining houses stand aloof from each other. The plants that made the vehicles that built this town shed chunks of graffitied concrete. Glass is gone from a million windows, like eyes absent from faces. I ricocheted from high hopes to despair. But the Detroiters I met, almost to a one, have faith in even an uncertain future. Indeed it’s what defines them. Those who couldn’t summon hope left long ago, if they could. Excited by the city’s new effervescence, he searched Google for graffiti artists, interviewed several, hired one, and gave him a key and instructions: “Do whatever you want, wherever you want, whenever you want.” The walls are adorned with icons of Detroit, from Faygo soda pop to boxer Joe Louis’s fist. 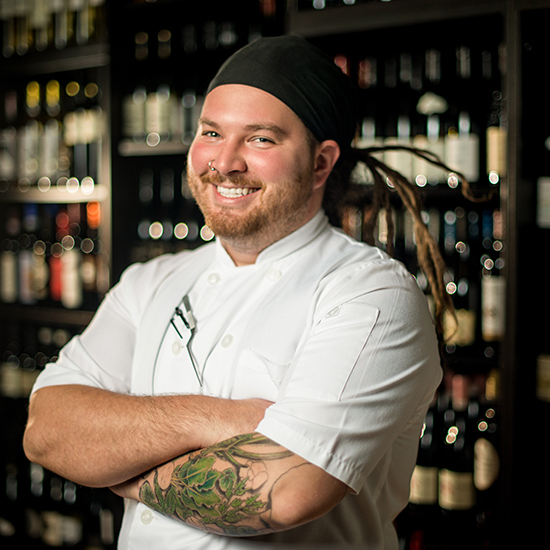 He’s hiring locally, adding 70 Detroiters to almost double his full-time staff. He thought: How blind I have been. I should give a T-shirt to every kid in Detroit. 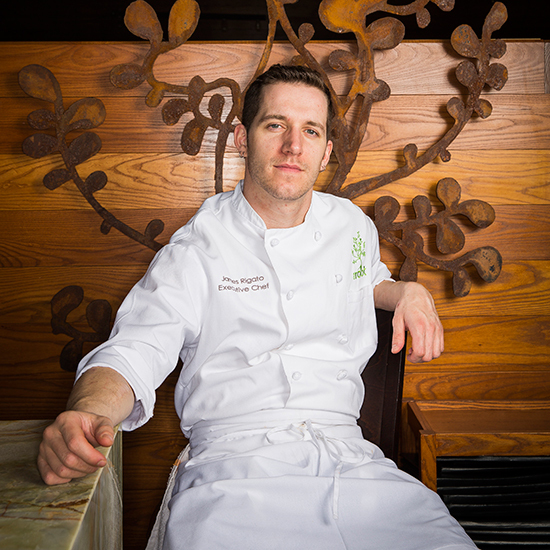 Robert Hake is emblematic of what’s happening in this once forlorn city. It is reinventing itself, building by building and idea by idea but, as important, person by person. More tangibly, freed from about $18 billion in debt, the city has money to do some of what needs to be done. It has replaced about 40,000 streetlights ruined by scrappers and time. Police response time has shrunk from almost an hour to less than 20 minutes. And roughly a hundred ramshackle homes are crushed each week. From his studio a few blocks from MyLocker, Antonio “Shades” Agee, the graffiti artist who’s painting it, isn’t surprised that Hake only recently discovered Detroit’s gloom. It’s easiest to stay on the city’s bright side. Agee grew up in Detroit. His Hispanic mother still lives in his childhood home, now one of the few on the block, in a neighborhood he doesn't like to visit. It’s not “the new Detroit.” Nor was Black Bottom, Detroit’s vibrant Harlem, where his father played jazz. It was bulldozed in the 1950s for redevelopment and a freeway. At 44, he is trim from biking; he rarely drives. His right arm—“my painting arm”—is densely tattooed. From the multi-tinted panes of his loft in a former paintbrush factory, Agee has watched Corktown change. He’s a regular at the Detroit Institute of Bagels, just below his window, built for a cool half million dollars. “It still blows my mind to see a girl running down the street and she’s not being chased,” he says. He’s genuine Detroit—gutsy, driven, growing up when he had to “find water in a cactus.” He says, “Detroit has originality because we don’t have any distractions.” At 15, he was drinking and drugging and tagging. Woodward Avenue, Detroit’s main street, now aglitter with shops and condos, “was so dead I could paint a wall and nobody would care.” Agee transcended the streets. His clients include Reebok, Quicken, and Fiat Chrysler, and even white suburbanites: He painted a grand piano with feel-good slogans and his signature giant lips. Click HERE For The Full 3-Part Series! On May 8-9, Detroit’s Hart Plaza will be transformed into the perfect venue for a brand new street skateboarding contest from the mind of Ryan Sheckler, one of the biggest names in the sport. The new event, dubbed Red Bull Hart Lines, sets out to produce a high-energy, high-impact skateboard event featuring an innovative new contest format showcasing 21 of the world’s best skateboarders. Red Bull Hart Lines will feature two distinctive lanes, each with its own unique set of skateable features. The course itself incorporates a mix of existing stair sets, rails and ledges in Hart Plaza, along with additional custom-built features designed by California RampWorks. Watch the course animation above for a sneak preview. Each skater will be required to skate each lane once, then for their third run, the athlete can select either lane to better their score. The top score from each lane then will be averaged to determine the skater’s overall score. With the majority of the professional skateboarding scene based in California, Sheckler wanted to bring a street competition to a place where passion collides with innovation. Pro Qualifiers: Friday, May 8 - 2-5 p.m.
Finals: Saturday, May 9 - 2-5 p.m.
Motown. Motor City. But there’s another nickname that suits Detroit's character best of all, these days: Renaissance City. Certainly, the past 50 years haven’t always been kind to this once-mighty industrial capital. But while Detroit’s fortunes have risen and fallen, thanks to a startling new surge in Detroit tech, in the arts, in design and in independent business, the city is now poised at the start of a brilliant period of regeneration. Welcome, ladies and gentleman, to the new Detroit. Michigan’s biggest city has been closely associated with the spirit of innovation for more than a century, and no one person was more influential in shaping its dedication to invention than Henry Ford. The unveiling of his iconic Model T in 1908 was the first major step in cementing Detroit’s status as a capital of progress, and other automotive leaders soon followed Ford’s move. By the 1950s, Detroit was a flourishing boomtown, a symbol of American technological ingenuity and a cultural capital full of Art Deco theatres, sweeping avenues, and grandiose architecture. Now, that same spirit of technological innovation is helping to foster Detroit’s phoenix-like rebirth. The city’s proliferation of available office spaces and low overhead costs has created welcoming turf for a new generation of start-ups and entrepreneurs. According to recent statistics, Detroit is growing at a faster pace than Silicon Valley – and is currently home to some of the country’s most-watched start-ups. Nowhere encompasses that spirit better than TechTown: a business accelerator and hub of innovation, it’s at the heart of the Detroit tech start-up boom. Situated in New Center, it has served 1,026 companies and contributed more than 1,000 jobs to the local economy since 2007. Not to mention that the very history of Detroit-brand innovation infuses its on-trend, open-plan office: located within a renovated Albert Kahn building that once housed Chevrolet offices, the Corvette was designed on its third floor. A distant view of Diego Rivera (1886-1957) and Frida Kahlo (1907-1954) kissing is an unusual, if apt, photo panel introducing an important exhibition at the Detroit Institute of Arts; but it also reminds us of the baggage that accompanies us whenever we see shows of artists we think we know. While not an assertive attempt at revisionist art history, “Diego Rivera and Frida Kahlo in Detroit” makes a solid case for Rivera’s stature as a major figure in 20th-century art, even if fashion, feminism and fetishism have conspired in his reputation being posthumously eclipsed by Kahlo’s. And it reveals the artists in a different light, suggesting that, like politics, all art is also (somewhat) local. Having spent the first two decades of the 20th century in Paris, Rivera painted some respectable cubist paintings and was very much a part of that city’s artistic community. Then, inspired by the promise of radical political changes, he returned to his native Mexico in 1921; he is best known as the primary master of the celebrated mural movement that is still one of that country’s artistic crowning glories. By 1929 there was already an English-language publication celebrating his murals. And in late 1931 New York’s Museum of Modern Art accorded him the honor of its second one-man exhibition (Matisse was the first). About a year earlier, in December 1930, the DIA’s then-director, William R. Valentiner, had met Rivera in San Francisco and, as recalled in his unpublished memoir, felt that the artist’s “interest in economic and industrial development . 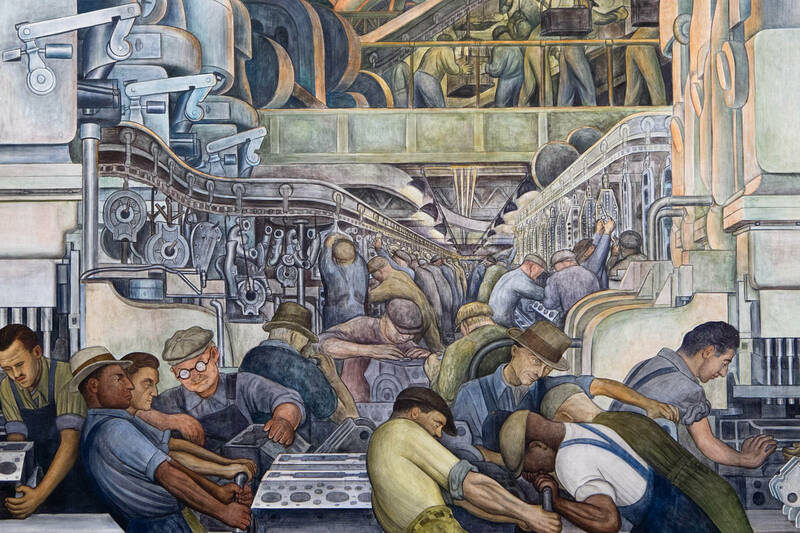 . . [was] particularly suited to portray Detroit and its industries.” With funding from Edsel Ford (Henry’s son), Valentiner invited Rivera to paint murals in the interior courtyard of what was then a relatively new museum building. The culture clash appears obvious: An artist known for his involvement with international Communism and for the left-wing political content of his art was commissioned to create a celebration of capitalism (officially “Detroit Industry”) in what was then one of its world hubs, with the tab being picked up by a prominent capitalist. What he delivered, after arriving in Detroit in April 1932, turned out to be a brilliant visual encomium to both the captains of industry and the workers who enabled their triumph. Happily, the Rivera murals have survived lots of political battles—over both their content and (more recently) their monetary value—remaining among the greatest in situ works of art in our country. The current exhibition sheds light on the careers of both Rivera and Kahlo, who were married in 1929, by bringing together 48 works by the former and 26 by the latter. More importantly, it enlarges our understanding of how the DIA murals were painted, with its special focus on the year (1932-33) the two spent in Detroit. It's Almost Speedo Weather, Detroit: Penobscot 50 Story Climb With A Certified Trainer Every Friday! Get ready for some fitness fun! Anytime Fitness Detroit is hosting fun-infused weekly stair climb at the Penobscot Building downtown Detroit at 12 o’clock p.m. every Friday during the Spring and Summer months. 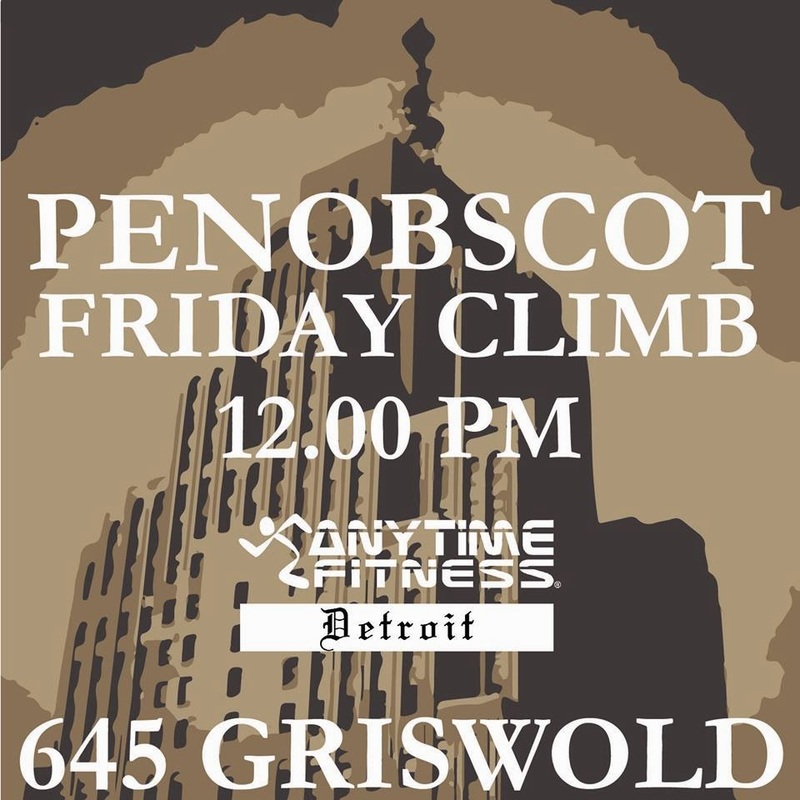 Penobscot Friday Climb will be lead by certified personal trainers and are designed for people of every fitness level. They are open to all adults, not just Anytime Fitness members. Techweek Detroit will kickoff on Monday, April 13, 2015 as it returns for its second year in Detroit. Offering the insights and wisdom of more than 30 local and national industry leaders, Techweek Detroit will build upon its reputation as the nation’s leading technology conference and festival. Presented by Quicken Loans, Techweek Detroit is dedicated to bringing together entrepreneurs, visionaries, influencers and thought leaders to make the world a better place through tech entrepreneurship while showcasing, celebrating and enabling emerging innovation ecosystems. The week long festival will culminate with a two-day conference and expo on April 16-17 at Ford Field where attendees can hear first-hand the importance of innovative technology from those who not only create it but pioneer it. Many of Detroit’s emerging success-stories across technology, including those in finance, startups, health, e-commerce, fashion, makers and more will be recognized and discussed at Techweek Detroit. It is the mission of Techweek Detroit to provide an open space for all who are passionate about technology to be a part of the conversation. · High-Profile Speakers: Techweek Detroit will showcase influential leaders in technology who will discuss trends, innovation, growth, action and change both for Detroit and for the tech industry as a whole. Notable names include: Tige Savage, Managing Partner of Revolution Ventures; Michelle Lee, Deputy Director of the US Patent and Trademark Office; Veronika Scott, Founder & CEO of The Empowerment Plan; Chris Rizik, CEO of Renaissance Venture Capital Fund; Jon Rimanelli, Founder & CEO of Detroit Aircraft; Jennifer Guarino, VP, Leather of Shinola; Luis Perez, CFO of Detroit Lions; Carl Erickson, CEO of Atomic Object; Dan Ward, Co-Founder of Detroit Labs; Elaina Farnsworth, CEO of Mobile Comply; Dug Song, CEO of Duo Security; and Chris Thomas, Found & Partner of Fontinalis Partners. A full schedule can be found at: http://www.techweek.com/schedule/detroit. · LAUNCH Startup Competition: Pre-qualified startups will compete for cash and sponsor-donated gifts valued at $50,000 from 1-5 p.m. on Thursday, April 16. Each participating startup will pitch its business and will be judged by a panel of top tech and business leaders, who will ultimately decide the winner of the 2015 Techweek Detroit LAUNCH Competition. · Hiring Fair: Whether searching for a new, exciting role or looking to bring an idea to fruition, the Hiring Fair is all about matching talented people with the right jobs. The Hiring Fairattracts top businesses, ranging from startups to well-established tech brands. Attendees who bring a resume will be granted complimentary access to the Hiring Fair, which will take place from 12 –5 p.m. on Friday, April 17. · Film Screening: Join fellow attendees at the Private Film Screening of Citizenfour. The 2014 documentary, directed by reporter Laura Poitras, tells the story of her clandestine correspondence with then unknown source “Citizenfour.” Five months later, she and reporters Glenn Greenwald and Ewen MacAskill flew to Hong Kong for the first of many meetings with Edward Snowden. The documentary won the Academy Award for Best Documentary Feature at the 2015 Oscars. The documentary will be shown at the M@dison Building at 1555 Broadway Street on Tuesday, April 14. Fashion & Wearables Runway Show: The latest in wearable technology and e-commerce will bring the intersection of technology and fashion front-and-center at the FashionTECH Runway Show on Friday, April 17 at 7 p.m. The show will feature technology leaders walking the catwalk in the latest styles provided by emerging brands and e-retailers. The show will be preceded by a happy hour from 5:30 – 7 p.m. and will begin shortly thereafter at Ford Field on the Summit Stage. Top sponsors of Techweek Detroit 2015 include: Quicken Loans, General Motors, Verizon Wireless, Priority Health and Goldman Sachs. As manufacturing grows more high tech, software will play a bigger role. Historically, the economies of Detroit and Silicon Valley couldn't look more different: the Motor City has long been known as a hub for manufacturing and the auto industry, while innovations in technology have dominated Silicon Valley. Despite their differences, these cities are actually more similar than most think. Increasingly, manufacturing has gone high-tech in Detroit, while the Silicon Valley/San Jose region has seen an uptick in manufacturing. This isn't what we might expect, but to understand this convergence, it helps to look at a recent Brookings report, which lists a group of 50 advanced industries, ranging from automobile manufacturing to software development. Together, they contain our nation’s most competitive and innovative firms. Nationally, these industries have an outsized impact on the economy—just 9% of the workforce, they produce 17% of gross domestic product and, since the end of the recession, advanced industries have created 65% of new jobs. It would surprise no one that San Jose and Silicon Valley have the highest concentration of advanced industries workers in the country, with 30% of all jobs in the metro area in one of these R&D and STEM-intensive industries. While some might think Facebook and Twitter dominate the Valley, manufacturing actually employs nearly half (46.1%) of workers. These 134,000 workers produce everything from semiconductors to computer equipment to aerospace parts and pharmaceuticals. The reverse dynamic is at play in Detroit. While the automotive industry accounts for over one-third of all advanced industry employment, services still employ almost half. Over 32,000 professionals in the Detroit metro area are employed in the computer systems design sector alone—many of which feed into the larger automotive supply chain. Still, even this data obscures just how much the business of innovation is changing —and how firms are responding. General Motors remains one of the largest employers in Detroit, mostly within automotive manufacturing. But increasingly, the automaker has also been getting into the software space, according to patenting data, which shows that GM filed 592 software patents over the past five years, accounting for over 15% of their patenting activity. Similarly, Google, a software company, is rapidly moving into manufacturing. Thirty-nine percent of its patents from 2007-2012 have been in hardware — computer hardware, yes, but also power and energy devices, as well as mechanical hardware—many originating from their ambitious autonomous car project. The very fact that the world’s leading software giant is moving into the automotive sphere (and that one of Detroit’s Big Three automakers invests so much in software R&D) shows just how integrated these two industries have become. Bloomberg Philanthropies announced the nationwide expansion of the Arts Innovation and Management (AIM) program, formerly known as the Arts Advancement Initiative. The invitation-only program seeks to strengthen nearly 300 small- and mid-sized organizations within six cities: Boston, Chicago, Dallas, Detroit, Los Angeles and San Francisco. Through the two-year initiative, Bloomberg Philanthropies will offer $30 million of unrestricted general operating support. It will also include arts management training in fundraising, audience development and board member engagement. Audience development: 79% reached new audiences through targeted marketing campaigns and social media. Board engagement: 95% improved board member engagement by adding new members and/or increasing board giving. Fundraising: 88% leveraged the grant to secure new contributions from donors. Detroit Bikes has announced a deal with New Belgium Brewing to produce 2,415 bikes to promote the beer maker’s Fat Tire Amber Ale. Detroit Bikes, North America's largest manufacturer of bicycles, will produce the custom-designed bikes at its 50,000 square-foot factory in Detroit. The company expects to add about ten workers to meet the increased demand and to begin shipping the Fat Tire bikes early next year. Inspired by the iconic bicycle on New Belgium’s Fat Tire Amber Ale label, the new bike will be awarded to New Belgium employees for their one-year anniversaries and used for fundraisers and other giveaways. “Zak and his team at Detroit Bikes exemplify the cultural renaissance that is currently happening in Detroit,” said McKee. 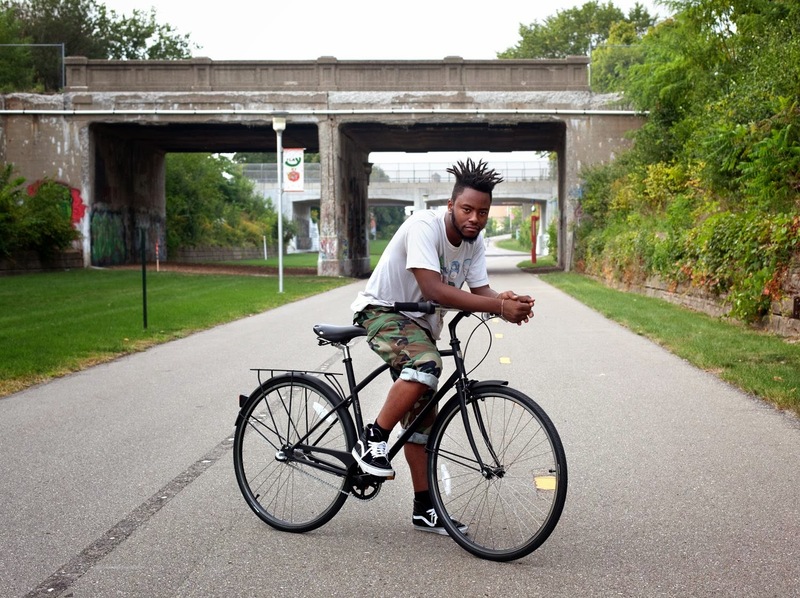 “We appreciate Detroit Bike's love and respect for the bicycle as a sustainable vehicle for change."